Tag: What’s in My Travel Makeup Bag? Summer’s here, summer’s here! It’s finally here! And with summer comes vacation and with vacation comes traveling. Undoubtedly, traveling is one of my favorite parts of summer, but as a makeup junkie, I find it difficult to narrow down my product picks yet, a satisfying challenge. 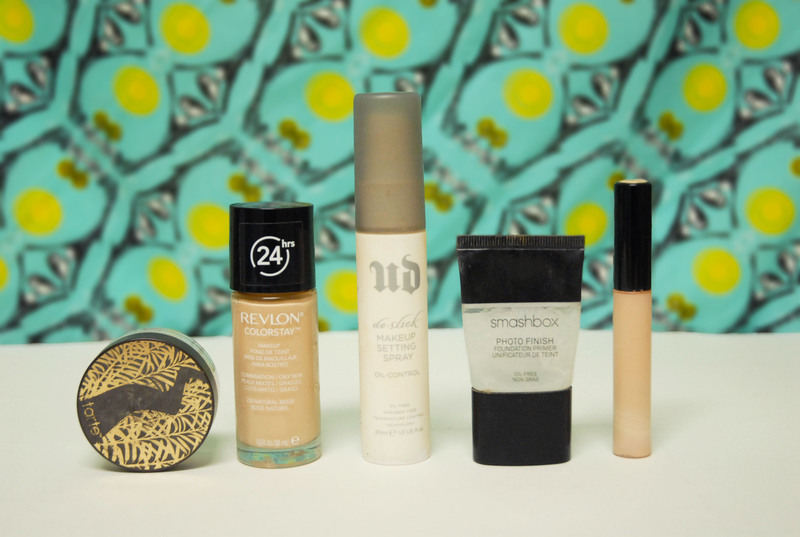 Nonetheless, here are my picks for an efficient, but versatile makeup travel bag. This bag is absolutely perfect for me! 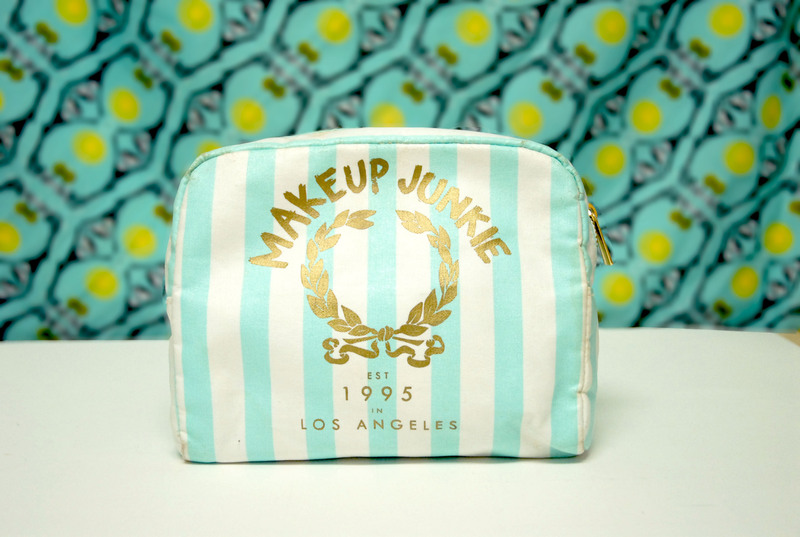 The mint and gold color scheme, the self proclamation of “Makeup Junkie”, and even the detail of “1995” which happens to be the year I was born. It’s like a match made in heaven! I got it from Forever 21 two Christmases ago, so I doubt it is still available, but Forever 21 does make some cute travel bags that are reasonably priced and pretty durable. The canvas is coated and lined nicely and this is one of my longest lasting makeup bags to date. Lorac Pro Palette– Out of all my neutral palettes this is the most travel friendly. It has half mattes and half shimmers so there is an equal amount of formulas at hand for lid colors, highlights, and blending. The packaging is slim cardboard which makes it light enough for travel. All of my Naked palettes are a bulky metal, so this is a nice alternative. The mirror is nice and wide, although not the best quality. You can put together both daytime and night appropriate looks since there are a few dark colors included. 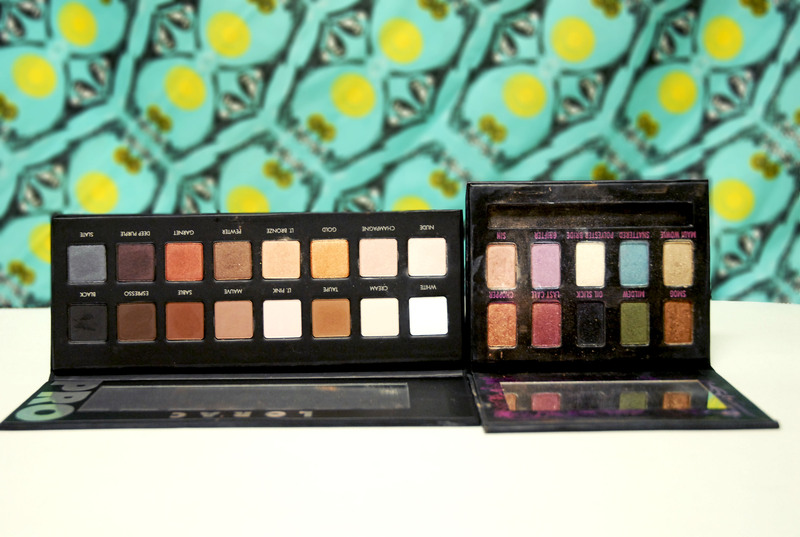 Urban Decay Ammo Palette– This is my perfect traveling color palette. It is also a slim cardboard and lightweight. It’s completely shimmers, but has a nice range of wearable colors in case I want to deter from neutrals. However, there are also a couple other neutrals in here that supplement the Lorac palette well. “Smog” is a beautiful dark brown shimmer shade that darkens up the outer v and lower lashline wonderfully. It’s not the perfect palette on it’s own as there are no blending colors, but it’s a nice addition. It’s almost always on offer as well. I got mine at a Marshall’s for $12 in it’s old packaging but it’s currently on sale on the Urban Decay site for $16. 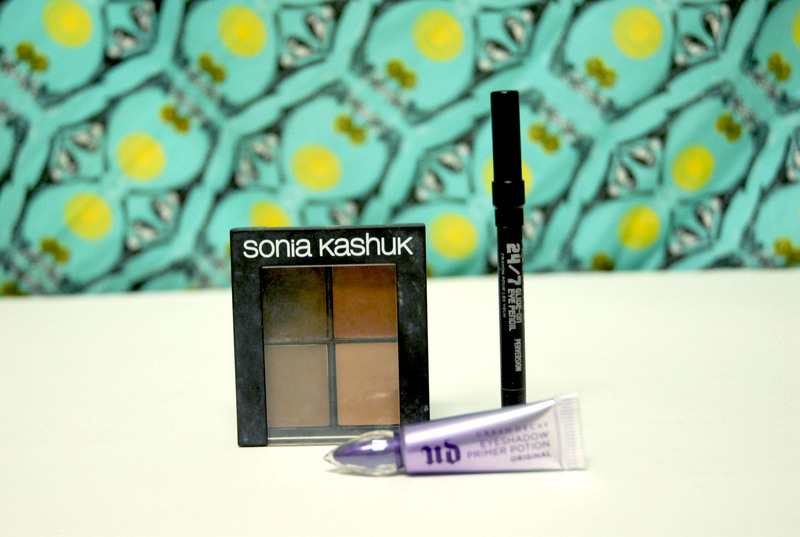 Sonia Kashuk Brow Palette– This is my go to brow product, however, I would ideally bring a double ended brow pencil which would eliminate also bringing a brush, but I have yet to find one that is the perfect ashy black without looking like Sharpie brows. I’m looking into a few options, so I will keep you posted. Urban Decay 24/7 Perversion Eye Pencil mini– Traveling is the perfect time to break out the deluxe samples and minis. I got this pencil in a mini set that also had a taupey brown, blue, and purple. (I can’t find the exact set, but a similar one is linked.) It was perfect because I don’t particularly need full size versions of colored eyeliners and having a mini size available of my go to has become super convenient. This can be used for typical eyeliner uses, to tightline, or to create a quick smokey eye. Mini Urban Decay Primer Potion– This sample in particular is extremely handy as it is essentially a free mini size of the full product which I got from Ulta in a large gift with purchase. However, the mini size is always available for sale. Tarte Smooth Operator Finishing Powder mini- I swear by this setting powder. I’ve mentioned this many times before, but it is a loose translucent powder which is finely milled. It smooths over pores and imperfections nicely to create a slight airbrush effect, but it is not filled with lots of silicones like the Makeup Forever HD Powder which can sometimes clog pores and cause breakouts. It is absolutely essential and the miniature size that is available is perfect size for travel. It’s not so small that you can hardly get any use out of it, but not as deep or heavy as the original size. Since it is a loose powder, it does tend to be messy but this packaging makes it easy to keep things under control. Revlon Colorstay Foundation– I opted for one foundation and went with a long wearing one since I will most likely be taking pictures and visiting sights throughout the day. Also, this can be sheered out by mixing it with the setting spray or primer and applying in layers with the Beauty Blender in case a lighter look is preferred that day. If not, this is the perfect longwearing and photo ready formula. Urban Decay De-Slick Setting Spray mini-This setting spray mini is the first bottle I ever tried of this product and has since been my fail proof product for finishing off makeup. Once I purchased the full size, I just refilled this bottle so that I did not have to bring the whole thing or put it into a generic travel bottle in which I would inevitably forget what was inside and waste the product. Since I did not pack an oil control primer, this serves double duty as a mattifier by being applied both before and after makeup. Smashbox Photofinish Primer mini– Once again, I cannot stress how many photos I take while on vacation, so looking as good as possible is not even a question for me. Inevitably, one of those photos will end up on a Christmas card and to avoid excess Photoshopping away of grease and zits, I just opt for a smoothing photo primer instead. This mini size is available in that “Aisle of Doom” near the checkout at Sephora. Collection Concealer– For days where I have sheered out my foundation, or don’t want to deal with the heavy formula, I brought my spot concealer to use instead. I also use this to clean up under the eyes, as I don’t need too much coverage under there. 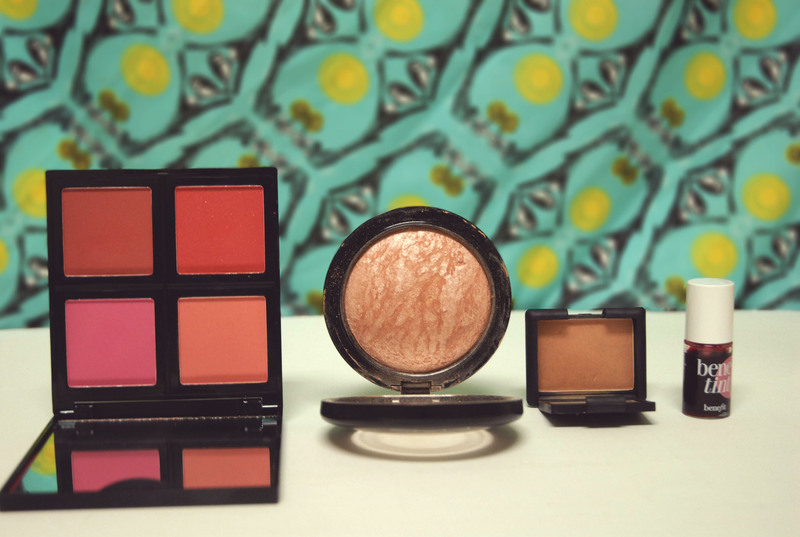 ELF Blush Palette in dark– I featured this product in my Beginner Makeup Kit post last month. For containing four blushes, this is quite compact. It’s not the slimmest product, but the mirror is fantastic, so I’ll give it that. Also, the variety in this palette covers both cool and warm, and deep and light. It’s the perfect quad that will literally match any look. MAC Soft & Gentle MSF– This is just the highlighter that I always go back to. It’s the perfect mix of both peachy and golden tones so it can sway either way on the cool to warm scale, and depending on the color scheme of the day, it will basically become a chameleon and highlight the same qualities in the makeup I am already wearing. NARS Laguna mini– This came in the Sephora SummerSummerstash last year and was a wonderful set of 10 deluxe minis, including this. It’s teeny tiny and takes up hardly any space at all. In fact, I think this is even smaller than the packaging for NARS’ individual eyeshadows. However, despite it’s small size, I can still easily fit my brush inside to get to the product. Although it is not a completely matte shade, this bronzer still can serve double duty and do a bit of contouring if applied densely enough to the hollows of the face. With a light hand, this adds the perfect amount of sunkissed glow and is suitable for most skin tones. 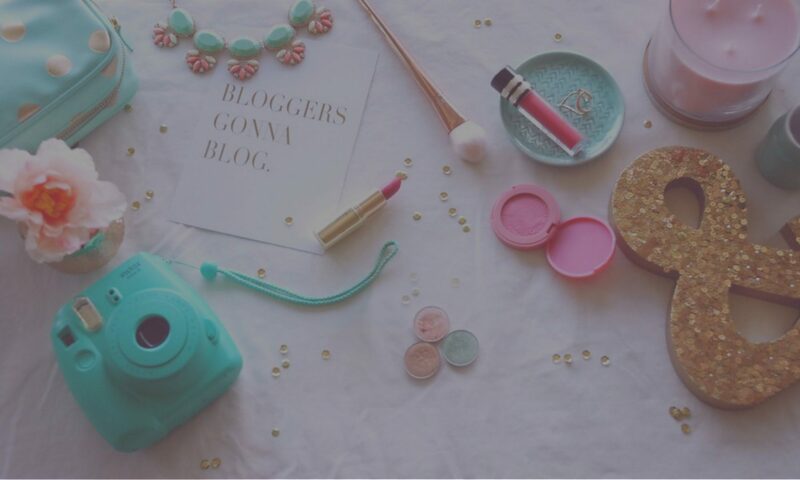 Benetint mini– I received this mini in a deluxe set of Beauty Blenders and Benefit products, which I hauled during the Sephora VIB sale. This product already is a multipurpose one that can be used both on the lips and cheeks and having a smaller size makes it all the more travel friendly. If you didn’t want to bring a whole palette of blushes, this would be a great substitute option. NARS Rikugien mini– This mini lip pencil is from the birthday gift set Sephora gives to it’s Beauty Insider members, so be sure to get yours during your birthday! It is a light, neutral color that is a wonderful “my lips but better” shade. Revlon Lip Butter in Sorbet– I’m not much of a pink lips kind of gal, but this sheer formula makes wearing this color much more wearable to me. It’s also very moisturizing, which is helpful for days which are spent out and about for hours while exploring on vacation. Colourpop I Heart This Lippie Stix– I mentioned this last week’s Favorites post. 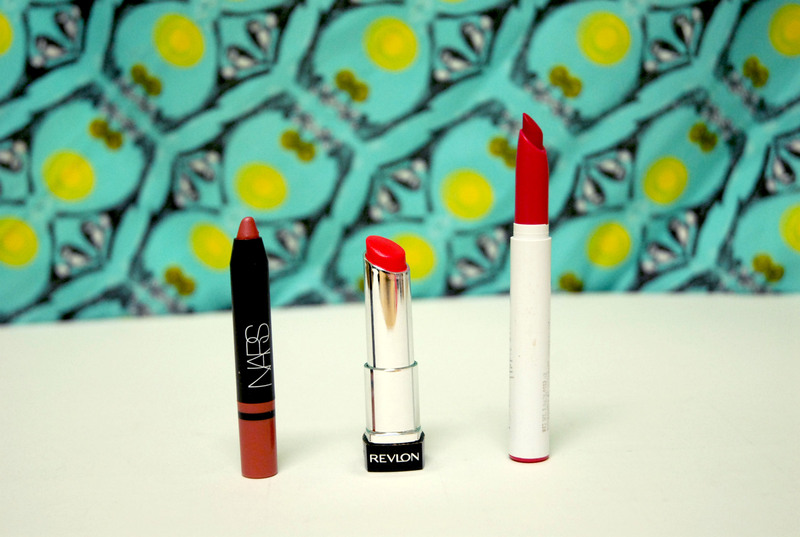 It’s a nice alternative to a classic red lip, especially for the summer months. It still packs a punch as a classic red statement lip would and even leans slightly towards red, but the cool toned more magenta color is a little more trendy and modern and can be worn both day and night as it is not too dark. Also, the matte formula is perfect for longwearing days and it is still moisturizing, so that after a long day or night the lips aren’t left feeling dry. Finally, this photographs beautifully since the cool tones create a whitening effect on the teeth by counteracting any slight yellowness in your smile. That concludes the contents of my travel makeup bag! I hope you enjoyed reading and found some useful tips. What are you bringing on vacation with you this summer? Where are you traveling to? Leave me a comment below!